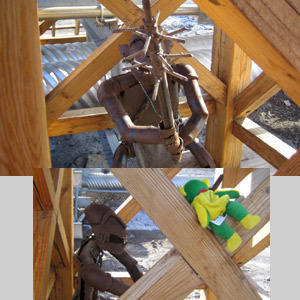 There seem to be lots of people with art talent in McMurdo. There are art objects all around town. 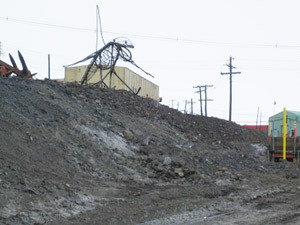 For example there is this whale sculpture that is made out of metal up on the hill that leads down to Hut Point. The footbridge between our dorm and Crary Lab had lots of different art on it and around it. The steps had a poem carved into them, there was a handmade sundial and a large metal wind chime which looked like it was made from CDs. We had crossed the bridge many times before we noticed there was a troll under the bridge. OzGold crept down to take a look and assured me that it wasn't real. It was made of metal. 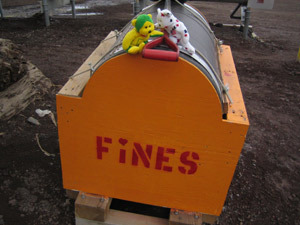 One other strange thing around McMurdo are these barrels with the word Fines written on them and shovels attached to the top. We asked about them and people said that "fines" is ground-up rock and that it is spread on top of the snow and ice in the winter to make things less slick. So they have fines barrels close to the stairways and people can just put some out when they see the stairs are not safe. 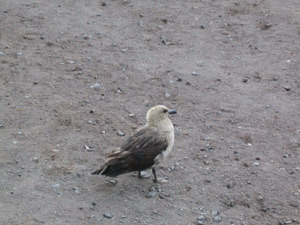 We also got one close-up of a skua just outside our dorm. Skuas are scavenger birds and they sometimes attack sickly penguin chicks and eat abandoned penguin eggs. They also seem to have developed a taste for salad. We saw one skua divebomb some people who were carrying salads to their dorms one day, trying to make them drop their plate. It was quite funny if you weren't the ones being divebombed. MVI-1215 (if I gave you a cropped version use that one). We went out every day to try to see a penguin. 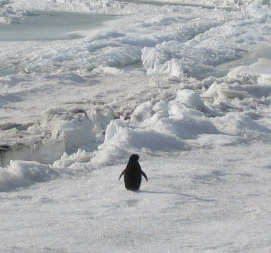 We were getting quite discouraged because it looked like we were never going to see one before we left Antarctica, but we finally found one Adelie out at Hut Point. Here is the movie we took of it. 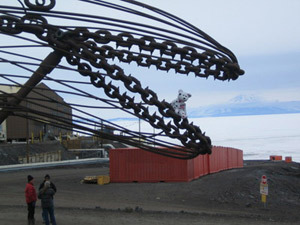 Sorry we weren't closer, but the Antarctic Treaty makes it clear that people are not to disturb the wildlife.